Wesleyan missionary David Cargill died in Tonga, age 34. His first wife , Margaret, died age 30, in Fiji, after the birth of her 6th child, over 7 years of marriage. 20 June 1809: David Cargill was born in Brechin, Forfarshire, Scotland on 20 June 1809, the second son of James Cargill, a banker, and Grace Mary Cameron Cargill. 1831: admitted to the church as a preacher. 1832: first missionary appointment for the Wesleyan Methodist Missionary Society, to Tonga, in the South Pacific. 1832: He married Margaret Smith (1809-1840), of Aberdeen on 6 September 1832 in Old Machar parish, Aberdeen, and left the country with his wife in October that year. They worked together on Vava’u, Tonga with another missionary for three years, during an important period of Christian development and revival. ( date?) The Cargills then moved with their young family and other missionaries to the Fiji Islands, where Christian influence was minimal. Margaret died there on 2 June 1840, and David Cargill, griefstricken, returned to Britain for a short while with their four daughters. 27 November 1841: He remarried on 27 November 1841, to Augusta Bicknell, and shortly afterwards was re-appointed to a training mission on Tonga. 11 August 1842: his son David was born aboard ship on 11 August 1842. During the voyage Cargill preached to his fellow passengers; the ship arrived at Hobart in late August of 1842. Cargill preached at many settlements in Tasmania, including Port Arthur. 15th December 1842: Cargills again set sail, this time on board the Triton, bound for their final destination of Tonga. 25 April 1843: died of an overdose of laudanum on. 25 April 1843: did Wesleyan missionary David Cargill, die in Tonga, of a self-administered overdose of opium? Two versions exist of the death of David Cargill; in one, he dies of smallpox, and , the other, an over dose of laudanum (liquid opium). Cargill’s diaries – and other reports of him – show he wore a high sense of self-importance. He was perhaps, at first, tempered by the mild manner and community-popularity of his first wife, Margaret. David Cargill married again; but remained obsessed with his first wife; a woman who appeared to require, and retain, a saintly patience. The possibility of suicide appears implied in reportage. The smallpox death-theory: ‘Cargill set foot once again in Vavou on 21st February 1843. On 29th March he preached twice in Tonguese and once in English. Within a month he was dead, succumbing to smallpox on 25th April’. wrote J. Malcolm Bulloch, in June, 1921. The Dengue fever theory : http://www.mundus.ac.uk reported ‘Cargill took over the superintendancy of the Vava’u Wesleyan mission from Peter Turner, and spent the next three months preaching at various mission stations, but was struck by dengue fever, leading to severe exhaustion. This illness, combined with continuing grief for the loss of his first wife, deepened the depression to which he was prone; he died of an overdose of laudanum on 25 April 1843’. Ma’afu feared by Cakobau: ‘From that time onwards Ma’afu became more important in Fijian affairs. He became involved in other chiefs’ quarrels and wars and sometime the presence of Tongan mission teachers gave him an opportunity to bring his warriors and impose his authority. By 1858, Ma’afu was possibly the most powerful man in Fifi, feared even by the great chief of Bau, Cakobau, who Europeans called Tui Viti, of King of Fiji’. Berthold Seeman wrote, ‘In March 1855 Siaosi arrived from Tonga with forty drua (ships) and 10,000 warriors, turning Cakobau’s siege of Kaba, into a victorious charge. 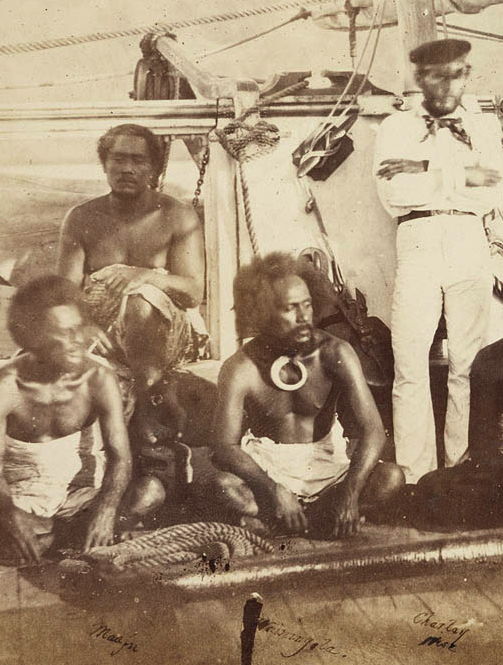 After some ambassadors were killed on the shore, the Tongans on their way home, killed 300’. Siaosi (Taufa’ahau) aso known as King George, Tupou II, ruled Tonga from 1852-1893. Book sparks cotton boom: Seemann’s book gave a favourable account of the possibilities of commercial development in Fiji (or Viti as it was originally named). He has been credited with sparking an influx of Australian settlers there in the 1860s, at a time when British sovereignty of the islands was being debated.